HEARTWIND - "Too Late for Roses"
German Melodic Rock label AOR Heaven will release two gems from their favourite genre on April 27! 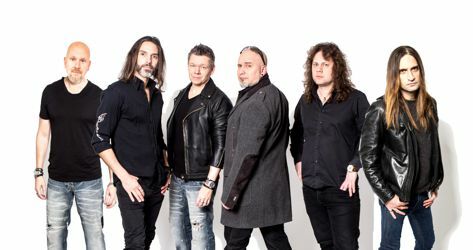 First, we have the debut album from Swedish Melodic Rockers HEARTWIND who will release their debut album “Higher And Higher”, secondly the classic “State Of Rock” album from the German group FRONTLINE, re-mastered by guitarist Robby Böbel, will be re-released in a ltd. edition with 1000 CD’s only and two bonus tracks. With members from bands like Constancia, The Poodles, Token, Narnia and Essence of Sorrow, and with guest stars Nina Söderquist (Bjorn Skifs/Badrock, Champions of Rock a.o. ), Janne Stark (Grand Design, Mountain of Power a.o. ), and Tåve Wanning (The Voice, Adrenaline Rush, Peaches), new melodic hard rockers Heartwind may come across as one of those one off band projects, but nothing could be more far from the truth. Heartwind is the story of two old friends, with a common love for classical melodic hard rock and AOR, that after fifteen years of friendship started to write the album they always had wanted to listen to themselves. Over a meal in downtown Stockholm, guitar player and songwriter Goran Engvall (former with Hitworks) and progressive/melodic keyboard player and fellow songwriter Mikael Rosengren (Constancia, Token, Scudiero), laid down the vision for what was yet to come. 15 original songs and 12 months later, Mikael started to pull some strings from his many fellow musicians in the Swedish hard rock scene since 20 years back. The two songwriters were amazed with the positive response they got on their first demos, from hard rock industry people & fans. It became evident that they were going to be able to attract some great talent to the album and the band. Believing in the importance of fellowship and a strong people fit when starting a band, Mikael and Göran started to dig in closest ground: Drummer Peter TrumPeter Svensson (Constancia, Faith) and singer Germán Pascual (Narnia, Dj Mendez, Essence of Sorrow), happily joined the band, and two key pieces of the puzzle came into place. With Peter and Germán onboard, the band knew they had both a powerful backbone and a phenomenal front man in place! After publishing a short teaser on Youtube, just before X-mas 2017, Heartwind stood ready as a band and was offered record deals by no less than three (!) different labels. Heartwind was happy to sign with AOR Heaven in early January and making an old dream come true. In 1995, FRONTLINE pulled out the full acoustic album "Two Faced“. However, personal differences within the band followed and ended up in the departure of Stephan Bayerlein and Thomas Riess in 1996. They were replaced by Thomas "Hutch“ Bauer (Bass) und Rami Ali (Drums; EVIDENCE ONE, SHYLOCK). 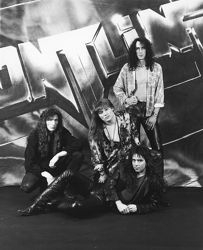 Still in the same year, FRONTLINE signed a record deal with a new label, recorded the single “Man In Motion” and the album “Heroes” which though officially only saw the light of day in Japan since their European label went out of business. One year later, the band decided to start working on another new album which is well known under it’s working title “Heroes II” amongst the fans but never saw a release. Due to a complicated contractual situation many labels feared to contact FRONTLINE during the following years and the band went back to the underground again until Georg Siegl at AOR Heaven finally showed his interest in the band in the year 2000 and signed them for the first time. Just one month later, the album “Right Attitude” was released which can be regarded as a sort of compilation out of both “Heroes” albums and “Right Attitude” became a huge success for the band again! 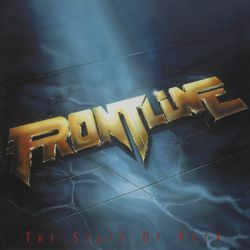 The recordings for their 2002 output “Against The World” started the same year, and this album finally re-established FRONTLINE on the international hard rock market. On April 27th 2018, AOR Heaven now will re-issue the rare and out of print album “The State Of Rock” with two bonus tracks as a limited edition of 1000 copies. The album was re-mastered by guitarist Robby Böbel.